If you have a queasy stomach, like I do, and don’t like looking at medical things like stitches and incisions, you may want to consider NOT reading this post. I know I have some followers on my blog for my CMT posts (Hello! *waves*). This post is for you! The leg braces I wore for the past 3 years were starting to wear down my knees. But because the heel of my left foot could not reach the floor, they couldn’t fit me into better ones. So mission #1 – completely rebuild the foot. That’s what I had done on June 10th. Now, I’m a strong girl. I’ve gone through a ton of crappy things in my life, but I’ve always felt that everything I’ve gone through has made me stronger. This past week of recovery has definitely been the hardest thing I’ve ever done. On my left foot my surgeon did eight major and two minor surgeries. I have 8 incisions. I couldn’t look at it before they casted it on the 11th. He told my husband that it looked like it was in a shark attack. When I finally had the guts to look at it tonight I see just how right he was. Shark Bait Hoo Ha Ha. 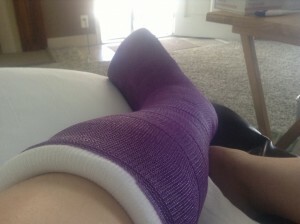 This was what my foot looked like this morning. My surgeon said it looks good –>. 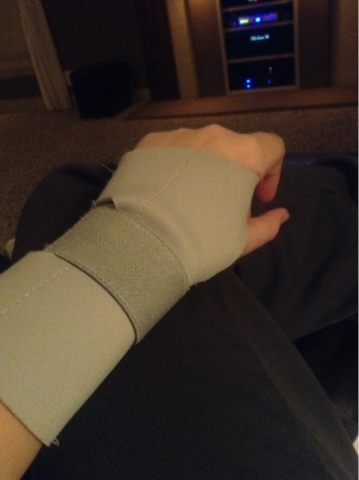 But then I came home to an unspeakable amount of pain that my pain medication is barely making a dent in. I hope it’s better tomorrow. I’ve had a few people ask me when I’m getting my other foot done. At this point, never. But we’ll see once it’s healed. Maybe I’ll change my mind someday so I’ll have matching feet. Maybe someday I’ll forget how badly this one hurt. Maybe. 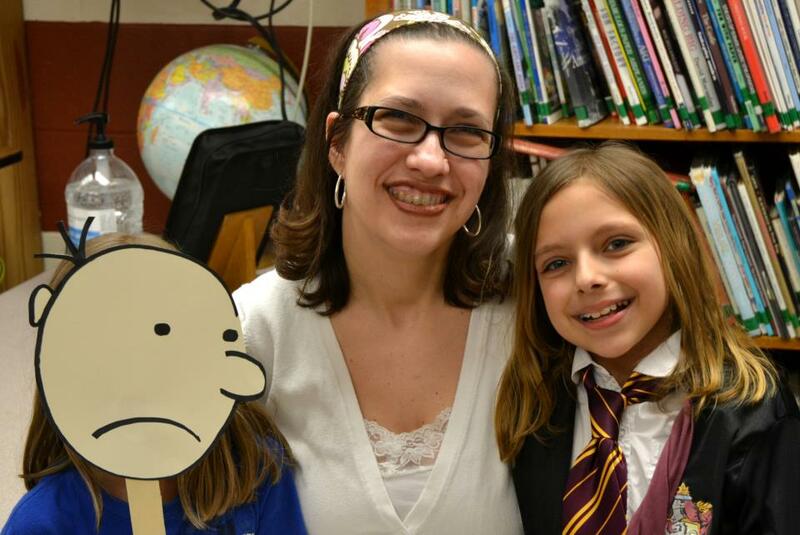 Recently for Children’s Book Week the entire school dressed as their favorite book characters. It was a fun day! Of course I dressed up (um…Librarian? How could I not?) — here is a photo of my daughters and I. Can you guess who we were? Our fourth grade teacher dressed in a flapper costume and said she was Stargirl. I loved her costume, but hadn’t read the book yet. Time to fix that! I read it in a few hours. Loved it! Couldn’t put it down. I don’t understand why it took me so long to read it. Stargirl makes her own name(s), dresses however she wants (and not how everyone else dresses), brings a ukulele to school with her and serenades people on their birthday, makes random cards for people and delivers them, and all other non-conformist things. She doesn’t care what anyone else thinks. At first, the other students love her and her differences, but after a while they turn on her for being so different. 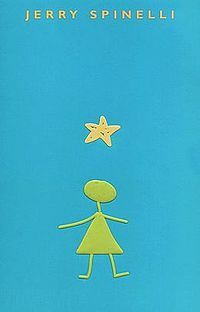 Throughout the whole book I was either like, “OMG, that is SO me!” or “OMG, I wish that was me!” I think everyone who reads this (boy or girl) will see at least a little of themselves in Stargirl. 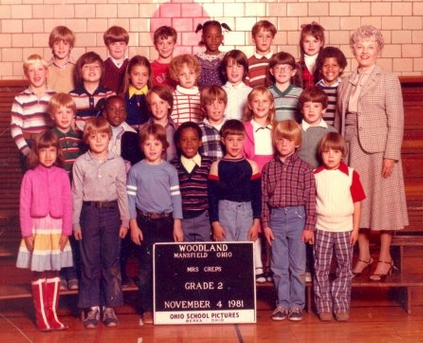 This is such a fantastic story about fitting in and even more importantly – not fitting in. 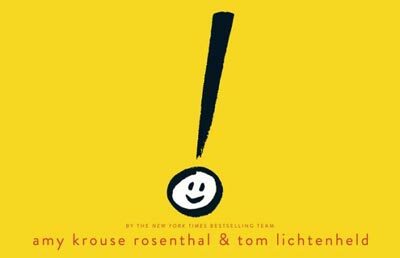 If you haven’t read it, then please do! It’s the best book I’ve read so far this year. Can’t wait to read LOVE, STARGIRL. I decided to read only middle grade books in May (hence the name — Middle Grade May!) and I thought I’d share a few of the ones I’ve been reading on my blog with a little review. 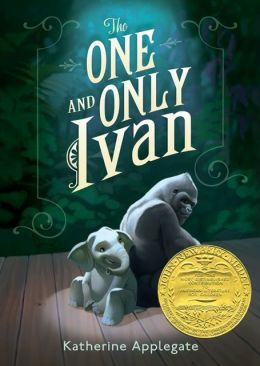 I wasn’t sure what to think of this one, animal stories aren’t usually my favorite, but I’ve seen it on just about every list, so I thought — why not? I downloaded it before I left for an all-night mall lock-in with my daughter. Even with dance music from the DJ blaring in one ear and hundreds of screaming, dancing, running girls blaring in the other one. This is the first book I’ve ever read of Katherine Applegates, even though my students adore her Animorph’s series. I don’t know if this is her normal style of writing, but I LOVED it. Simple and beautiful. The characters she created were wonderful and I used four kleenex’s when I read it. That’s my idea of an amazing book. It was cute and one of the best books I’ve ever read. I liked how the chapters were small and my favorite character was Bob. I’m sure you know what TMI means, right? When I sent my first round of queries out for The Chaos Shelter, that’s what my query had. TMI. Thankfully, I realized it after I started to get rejection after rejection from those first 15 queries. My book was great and I was sure people would love it, but the agents I sent it to just couldn’t get past the bad query. So after I sulked about the rejections for a month, I picked my feet up and met my critique partner/friend at Barnes and Noble (there she is in the background!). There we grabbed four middle grade books in my genre and I studied them. Hard. Then I looked at a bunch more of the middle grade books I had at home, also in the same genre. I learned so much just from doing that. 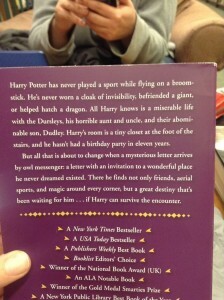 If you can see the photo clear enough on the right, read what it says about The Sorcerer’s Stone. Does it say anything about Ron? Nope. Does it say anything about Hermoine? Nope again. All it says is “friends”. My MC had friends, too, but I had named them by name and talked about them a little too much. That was the first thing I changed. 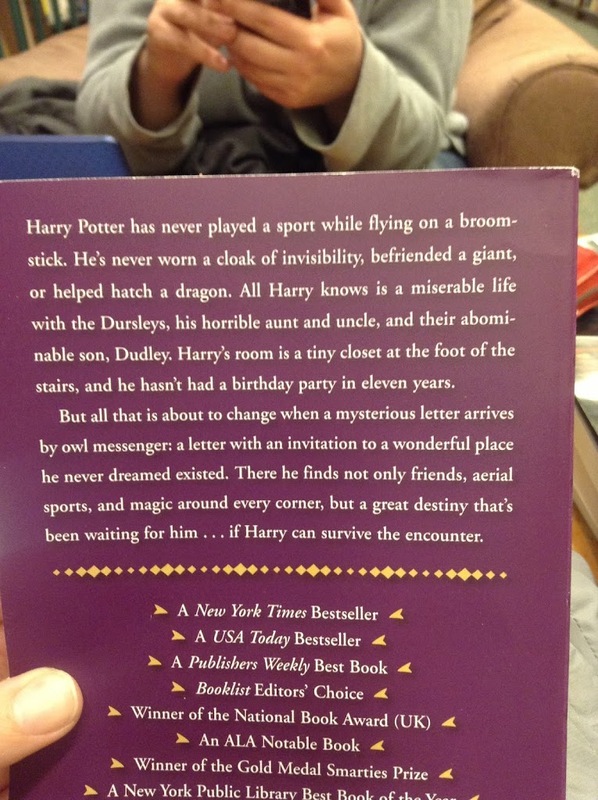 I managed to strip my query down to two short paragraphs that only told the basics, and check out the last line in the Harry Potter synopsis above. That last sentence alone would make me want to read the book. High stakes there, right? So that’s what I did (only different!). What are the stakes? What will your MC lose or what can they gain? Make everyone who reads it want to read your book! And if you need to learn how to do it from other books, then learn from the ones that worked. A few years ago, after I’d written my first book, I looked online for a beta reader. I was SO lucky to find Kellie! She is such an amazing reader and “got” my story – and let me tell you, that’s the best feeling. Over the next few years we’ve kept in touch and I’m SO EXCITED that Kellie wrote her own novel and I’m just as excited to be a part of her blog tour for Mortality! 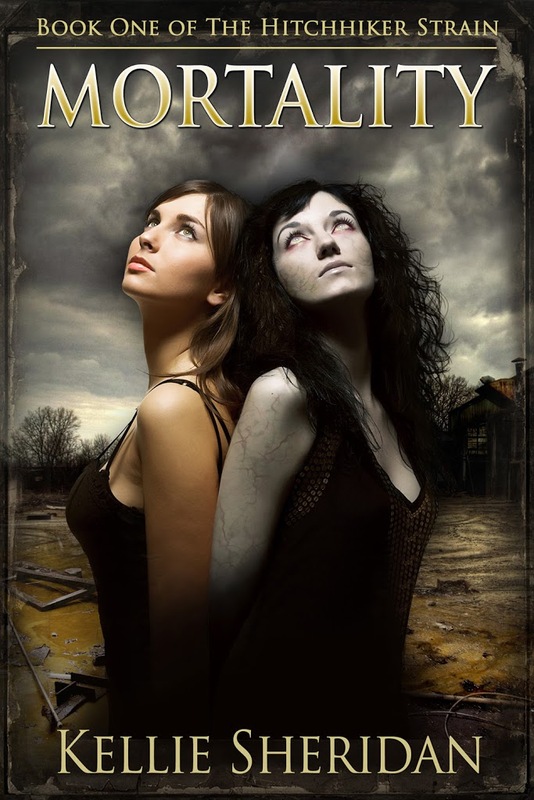 Synopsis: After surviving a deadly plague outbreak, sixteen-year-old Savannah thought she had lived through the very worst of human history. There was no way to know that the miracle vaccine would put everyone at risk for a fate worse than un-death. Now, two very different kinds of infected walk the Earth, intent on nothing but feeding and destroying what little remains of civilization. When the inoculated are bitten, infection means watching on in silent horror as self-control disappears and the idea of feasting on loved ones becomes increasingly hard to ignore. From the moment I could walk, I’ve loved boots. I think my first pair were white go-go boots in the 70’s. The 80’s had me doing my best Wonder Woman imitation (—> see photo on right). But that’s when I could walk without my braces. Believe me when I tell you I’ve tried my hardest to find a pair that I can wrangle those braces into, but it’s pretty much impossible. To put on a pair of boots you have to flex your foot and my braces were not built to flex. Major bummer. This week I suddenly needed a good, somewhat professional looking photo of myself to put on the Adams Literary website. My good friend, photographer and critique partner, Renee, was going to take me out Sunday to take some pictures for me. While seeing Oz with the fam on Saturday the thought occurred to me – I need to wear boots! Then I wouldn’t have to try to hide my leg braces, my silly tennis shoes, and I would look like a half-way normal person! Even before the credits rolled I leaned over and whispered to Chad, “Can we stop at the shoe store on the way home?”At least in the dark theater I couldn’t see the weird look he probably gave me. But that’s why I love him so much. He knows I’m crazy and just goes with it. Now, here’s the reality. I can’t walk without my braces anymore. My balance and my ankles are shot. But I was sure I needed a pair of boots anyway, even if I had to carry them with me to the shoot and put them on while I was sitting there. They would look cute, and isn’t that all that matters? No one would need to know I can’t really walk in them. So Chad took the girls in the pet store next door to give me time and sanity to try some on. I tried so many on and I think I fell in love with each pair. But then I sat there, among the half-opened boxes of boots and realized something. I don’t need cute boots to be happy with who I am. I thought I’d moved past trying to pretend I’m someone that I’m not. But I guess everyone has their moments of weakness, including me. I wrapped them all back up and had them all back on the shelves before Chad and the girls came in. I walked out, not with new super-cute boots, and without a missing chunk of change from my bank account. I am who I am, and no amount of fake boot wearing will ever be able to change that. 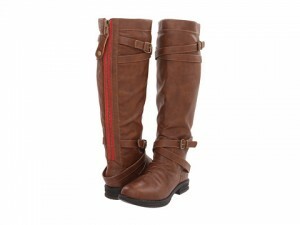 For now I’ll just dream of the day when someone will design some cute boots that fit over clunky leg braces. I haven’t see the pictures yet, but I know I’ll like them a lot more knowing that it’s the true me in them. Just a quick announcement – I used random.org to randomly pick the winner and the free pass through the submission window for Pitch Madness goes to Kimberly VanderHorst! Congratulations, Kimberly, and good luck with your pitch! I love reading “How I found my agent” stories, reading others stories kept me going when I felt like giving up. So I thought I’d share mine since I finally have one to share. Not more than 2 weeks later, I got a post card in the mail about an SCBWI Conference in Pittsburgh where one of the speakers would be Quinlan Lee from Adams Literary. Well, I took this as a sign. I was meant to take my book to Pittsburgh! So my mother-in-law joined me and we drove the 4 hours to the conference where I would have a 15 minute critique on my first five pages from Quinlan (it was kind of a crap shoot on who would critique your first pages, but somehow I ended up with Quinlan.) Ummm… I believed that was sign #2! Poor Quinlan got my first query letter ever. And I’m such an email packrat that I saved it. It’s hideous. It starts with a rhetorical question. Then I tell her it’s 50,918 words. Everything they say NOT to do in your query letter, I did it in that one. A month later I got a very sweet personalized rejection. I was crushed. But I moved on and ended up getting 10 requests out of the 100 queries I sent out for it. They all ultimately ended in rejection and I convinced myself that 100 was the magic number to move on. I spent the next year writing another novel that I half finished. An old friend (Renee!) contacted me about forming a critique group around the same time I got the idea for THE CHAOS SHELTER. I spent 2012 writing that and put the finishing touches on it during this past Nanowrimo. But right before I finished it I went to another SCBWI conference in Cleveland. I signed up for another agent critique, but not with Quinlan, even though she was going to be there. I didn’t want Quinlan to think I was an Adams Literary groupie or something, following her from city to city. LOL Not to mention it’s been two years and I knew she wouldn’t remember me. I was wrong. I was leaving the conference after it was over and she stopped me in the hallway when we passed each other. She said “Hi! How are you doing?”. She asked how my kids were doing. We talked for a bit, and then I left. I was kind of floored and majorly impressed. January 1st came and I sent out my first 15 queries. From almost everything I’ve read, they say your second book almost always gets more requests than the first. Well, in a week I’d gotten back 12 rejections and NO requests. Now, I’m usually one of the happiest people you will ever meet but that depressed me. I gave up after those 15 queries. I stopped checking my query email box and I didn’t send out any more. I started to think of ideas for something else I could write instead. It was obvious that this book just wasn’t going to appeal to anyone. The month of January went by. Then for some reason I thought to check my query inbox the second week of February. There was an email. It was a full request. WHAT? SERIOUSLY? And that gave me hope. That weekend I sent out around 25 queries and the full ms to the requesting agent. After a few days I had 2 more full requests. Then after a week I heard back from the agent who had sent the first request. She loved it, but had some ideas and wanted to know what I thought about them. I spent all weekend and wrote up my thoughts. She emailed the following Wednesday and asked if we could chat on the phone and ultimately offered representation. I loved her, but with so many queries and some other fulls out there I knew I’d have to at least let others know and give them a chance. I told her I’d let her know in 9 days. I ended up with 3 offers of representation, more rejections and even more nice notes letting me know they loved the pitch but didn’t have enough time to read or consider it. Remember when they say “Be careful what you wish for, you just might get it?” That was my week. Having to decide tore me up inside. I liked all 3 agents for very different reasons. What it all came down to was my gut. I would’ve been in good hands with whomever I chose but I realized that from the beginning of my journey, my dream has always been to work with Adams Literary. Today Josh Adams became my agent and I couldn’t be happier! I have two pieces of advice if you’re still agent hunting. 2. SCBWI Conferences (or any other event where you can network with industry people) are invaluable. Go to every one that you can and don’t be afraid to chat with people! You never know where it may lead. OK, now for the GOOD STUFF! Over a month ago I was one of the fastest tweeters to Brenda Drake and won a free pass through the submission window round of her upcoming Pitch Madness contest. Now that I can’t use it, Brenda was sweet enough to let me give it away as a prize on my blog. So if you want to enter Pitch Madness and don’t want to mess with the submission window, etc. just post a comment on this post saying “I won’t give up!” and I’ll draw a random winner for it from everyone who posts their comment before noon on Sunday, March 10.